The world-building, plotting, and general idea for the story get an A-plus, but I was fairly disappointed with the writing itself. I went into it hesitantly, because despite the rave reviews for The Ocean at the End of the Lane, I just didn't love it. This was my second attempt at Gaiman, and I just wasn't blown away. The pacing was uneven - some parts seemed to drag on forever and others flashed by too quickly to be enjoyed. I wasn't sure exactly what audience Gaiman was reaching for, either. It felt too graphically violent in parts to be meant for a middle grade/young adult audience, but too simplistic and not quite developed enough for an adult novel. I think the fact that this is one of his earlier works and that it was written for TV as opposed for reading shows. I give the book slightly higher marks for entertainment value, because, as mentioned above, I think the creativity was astonishing. I loved the world Gaiman created and think the characters were fantastic. As I was reading, I kept imagining the story in visual format, as opposed to written. It was only after I finished that I learned it was originally a mini-series, and that really brought it all together for me. I think visual format really improved the story. Unfortunately, the slow portions were hard to get through and there were times where I found myself wondering what the point of the whole thing was. It's not one that I'm rushing out to recommend. You should know that the book has rave reviews from many, many competent readers, and that there is obviously a reason Gaiman has the following he does. For some reason, I just don't seem to connect to him on the same level that other readers whose opinions I trust do. I do think those who enjoy bad science fiction/fantasy television should watch the series. And I think that those who are familiar with London and would "get" the inside references may find the book more enjoyable than I did - it certainly has a lot of inside jokes that went right over my head, but that would be enjoyed by those with a better sense of London geography. 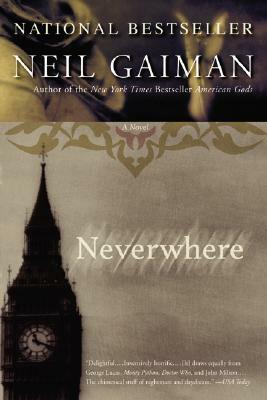 Sign into Goodreads to see if any of your friends have read Neverwhere.